LR; 2013 “Wishmas” List, 2014 25 Days of Elves, 2015 Home Along Quotes. Typically when I do a drawing challenge or prompt, I try to think of ways to make sure I’m not too overwhelmed with the task, because doing a drawing every day and being held accountable by an online community can be a bit stressful (while also being great fuel to keep with it!). The best way to alleviate that stress is by creating a theme or having some restrictions. Maybe you do a drawing challenge where you only use 4 colors, or maybe just pen and ink like the Inktober challenge. Taking the amount of possibilities out of something helps you focus and to think about how to continue creating within those limitations. With this years Santa Experiment, I threw all of that out the window. Instead of narrowing down what I could or couldn’t do, I decided that anything and everything was on the table. Really the only thing I had to stick to was to just draw Santa Claus each day. My goal was to try and push myself in trying new styles and mediums. 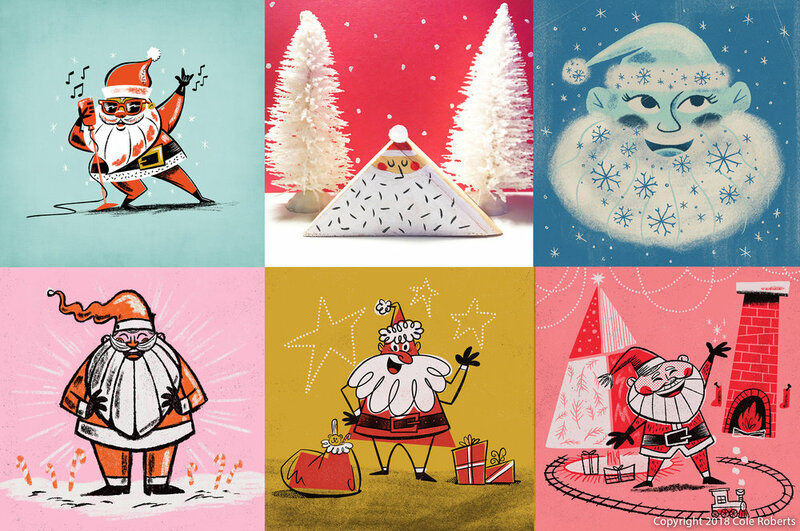 Even though every piece with the exception of one (my wood cut Santa) all the art was created digitally on the iPad. I had full intentions of experimenting with more traditional methods (paper art, charcoal, paint, etc.) but honestly, with all the work and deadlines I had approaching, it was best to just stick with something less messy and easy to work on anywhere, anytime of day. Not only was it great to create on the iPad which I’ve been doing and loving since 2016, but being able to really dive in and see how many ways I could use the fantastic “Mid Century Brush Pack” for Procreate created by the amazing Retro Supply team, was so much fun! Those brushes are so versatile. I drew something every day. That’s really the most important thing about a 25, 31 or a 365 day challenge is that you draw EVERY DAY. Even though full time illustration is my current job, you’d be surprised by how often you don’t get to draw. Having a reason to do a drawing every day is rewarding! The benefit of quantity. Let’s say you do a drawing every day for 31 days. You’ll have some awesome drawings, and you’ll also have some not so awesome drawings which is great! Because out of that 25 or 31, let’s say you have 10 pieces you’re super proud of, that’s TEN pieces of GOOD art you didn’t have before in a month’s time! Side story: I’ve been a fan of the musician Ryan Adams for a long time now. One thing I’ve always found interesting about him when he records a new record is that he generally has anywhere from 50-70 songs written just for that ONE ALBUM. Of course only 10-15 make the cut, but that’s because not all of the 70 plus songs he had were the best. I’m sure there were some good ones but only the best make the cut. It really proved to me that having a bulk of work done allows you to have a few diamonds come out of it. Art can be the same way. Do a lot, to get a few really really good pieces. Familiarity. Doing this prompt on the iPad using the same set of brushes has really shown me what I can do with them. I can’t wait to make more art this way and now because I know more about the medium I used, I can create quicker and more efficiently. New friends! I was able to connect with a lot of people while doing this challenge. I think there’s something intriguing about someone saying their going to do something for a certain amount of days, wheather it’s clean eating, working out or drawing, it’s fun to watch. I know I’m a fan of that. It’s so much fun doing these challenges online and seeing how it connects fellow artist, creators or just people who enjoy the subject matter. Christmas is also a super fun time of the year and i think some people just wanted to see that Jolly fat man on the daily, leading up to the big day! Stylistic Exploration! Pushing myself to try a new style daily was the main reason for doing this challenge. I wanted to see what I could do. Can I go super clean, can I make something look traditionally painted with digital tools, can I go cartoony or use simple shapes? Sometimes breaking out of our normal style can be scary but I kind of live for it. There’s always going to be a certain way I draw or approach a drawing but giving yourself the permission to step out of that can be so freeing and exciting and you might surprise yourself! I know there were a few times I surprised myself and that felt really good. There’ won’t be too many to list here, but as I stated before. I really wanted to break out of the digital work flow. Almost all the client work I do is digital. The Saturday I found some wood, paint and and hacksaw was so fun. Screen time on the eyes can be exhausting but with work and deadlines that had to be met, it was a lot easier to fall into the “digital trap.” I think if I do this next year, I’ll try to prepare ahead of time a bit more with my supplies. making sure I have everything i need in order pull myself away from the computer. Tiring. Yes, it was tiring. I’ve done 31 day challenges before, heck, I did two 31 day challenges at the same time this last October, and that could be why I felt tired this December. The added pressure of “anything and everything is on the table” definitely felt daunting at times. There were days I thought I couldn’t think of a single variation of Santa! Drawing challenges are hard. Make no mistakes about it. Good news is the outcome is so rewarding. The Retro Slump. I’m a retro addict. Seriously. I love retro art and while I had intentions of going more flat, or more commercial, more traditional, just about every piece had some sort of “retro feel” to it. No, it’s not a bad thing and honestly I can see a lot of my own quirks and drawing habits in the DNA of what I created. Maybe that’s it, the urge I have to add something “vintage” to my work could be the thing that makes it “my style”. At least at the end of the day, it’s how I love to draw, but for the sake of the “experiment” I was hoping to branch out just a bit more. I wanted to branch out in style and and I feel like I did. I’m so stoked on how some of these came out. I really like all of them, some more than others. 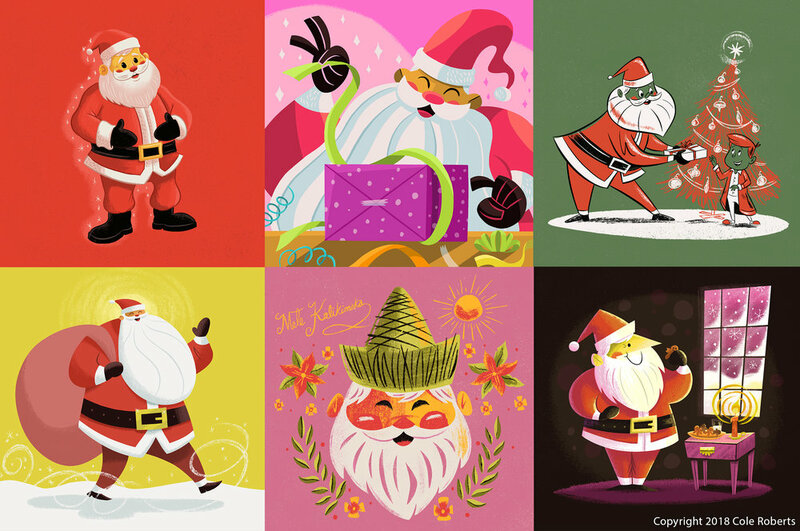 It was fun to take a single character (Santa) and try making him look youthful, old, geometric, tall, short, fat, you get it. I also really hope that this can lead to me doing some Christmas work in the future, whether that be a store display, gift wrap, gift card, greeting card, packaging, I’m down for it! Overall, This was SUPER fun. That’s the real reason you should do anything. If not for other people, a client, potential job or even practice, just do something for fun. You probably need some fun in your life just as much as I do.